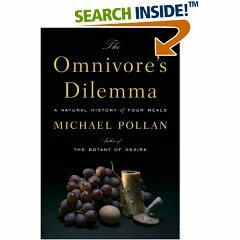 Author Michael Pollan offers unique, enlightening, and entertaining insights into the food we eat in his new book, The Omnivore’s Dilemma: A natural history of four meals. Among the issues Pollan discusses is that of modern cattle raising practices: the rush to fatten a cow from an 80 lb calf to a 1200-pound, bloated cow over a period of 14 months. Nature created this animal to mature over a 4 to 5 year period through grazing, thus it’s beautifully “engineered” ruminant system that allows it to digest cellulose in grasses, a process that humans and other mammals are incapable of. The pressures to bring greater quantities of beef to market at a reduced price and make more money have resulted in a farming industry that encourages the incorporation of unnatural, often inhumane practices like corn feeding (rather than grass grazing), refeeding of bovine body parts (thus “mad cow disease”), and widespread and chronic administration of hormones and antibiotics. The industrialization of food has de-personalized the act of eating. You no longer have any connection with the green pepper in your salad (unless you grew it yourself), nor do you have any appreciation for the suffering of the cow in your hamburger. Worse, the distortion of livestock raising practices has modified the food composition of meat. Range-fed animals, leaner and richer in omega-3 fatty acids, have been replaced by the marbled, saturated fat-rich modern grocery bought meats. This is a theme that Pollan reiterates time and again: how food processing adds value to the manufacturer, often starting with a healthy ingredient but modifying it, adding ingredients, taking out others, until it’s something decidedly unhealthy. Yet the manufacturer will trumpet the fact that a healthy ingredient is included. Breakfast cereals are the most blatant example of this. What the heck are Cheerios but an over-processed attempt to make more money out of the simple oat? Pollan’s eloquent and unique insights into food are definitely worth reading. As always, per our Track Your Plaque policy, I recommend Mr. Pollan’s book strictly on its merits. We obtain no “cut”, commission, or other financial gain by recommending his book. Track Your Plaque members pay their modest membership fee for truth. They do not pay for us to advertise something that provides hidden advantage to us. We do not advertise, editorialize to steer you towards a specific product or service. What we say, we truly believe.